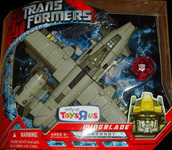 Wingblade is the best there is at what he does, and what he does is hunt Decepticons. The only Autobot with more confirmed deactivations to his credit is Ironhide, and that's only because Ironhide has been around longer. He trains constantly in both robot and vehicle mode, and maintains a database of vehicle scans so that he can rapidly train up in new modes. Where other combat-hardened Autobots are scratched and dented, Wingblade keeps himself meticulously clean. He and his weapons are always clean, sharp, and dangerous.